With my sweet tooth and lifelong addiction to sugar, I was fascinated to find a whole encyclopaedia has been devoted to the story of the human predilection for sweet food – ah, it’s not just me then. 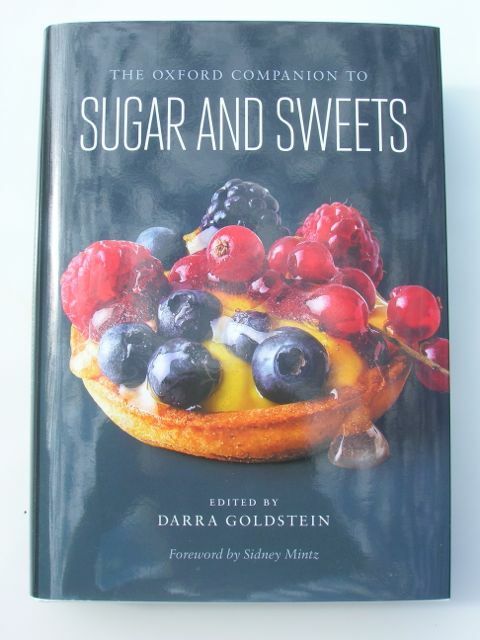 The Oxford Companion to Sugar and Sweets, edited by Darra Goldstein, has just been published and happily a copy landed on my desk. As with all good encyclopaedias, it is a fascinating collection of facts, stories and ideas that can be dipped into at will as well as being used as a reference tool. With nearly 600 entries, 265 contributing experts, 160 images and two full-colour inserts, Dara has fashioned a veritable treasure trove. My only reservation was that the images were all in black and white, apart from the colour inserts obviously, which makes the book seem a little old fashioned. History, politics, language, religion, art, science and of course food are all covered and demonstrate how sugar has been an integral part of human development and civilisation. Appendices at the back are a nice touch, with entries for films and songs that have been influenced by sweets: from Julie and Julia to Like Water for Chocolate and from Blueberry Hill by Fats Domino to Jelly Roll Blues by Jelly Roll Morton. Two more appendices list pastry shops from around the world and confectionary museums. Who knew there was a museum specialising in gelato or one on Thai desserts? Running through the list of contributors, I realised I wasn’t nearly as “up”on the subject as I’d imagined. A few names like Rose Levy Beranbaum, Ivan Day, Trine Hahnemann and Maricel E Presilla, jumped out at me, but most were unfamiliar. Some entries, such as the one for stevia are quite short, others such as children’s literature span several pages. I learnt that wagashi means Japanese confectionery and that mochi and dumplings have been made in Japan since the prehistoric era. I was surprised to find that Marshmallow Fluff, which I only heard about a couple of years ago has been made in Massachusetts since 1920. Our very British pudding comes from the French boudin which originally meant sausage and referred to blood pudding. Nearing the end of the book, I was interested to see the entry for xylitol states that not only is this sugar substitute suitable for diabetics, but it’s also good for dental health. Both CT and I use it as a mouthwash for this very reason. Not all the subjects covered are “sweet”, there are entries on dental caries, diabetes and the despicable horrors of slavery in the sugar plantations. It was Europe’s growing demand for sugar in the Seventeenth Century that kickstarted the international African slave-trade. Oh, our western civilisation has so much to be proud of. I was pleased, if not surprised, to see that chocolate gets more than just a mention. There are entries for single origin, cacao, chocolate pots and cups as well as the expected pre and post Columbian history. Although I have read many histories of chocolate in my time, it hadn’t quite sunk in that the Americas had been producing chocolate for over 2,500 years before it was “discovered” by the West in the Sixteenth Century. Many of the brands have their own entries such as Cadbury, Lindt, Nestlé, Mars and Hershey. Published by Oxford University Press and retailing at £40, this hardback book is a serious and thorough exploration of the subject of sugar and sweets and would make a valuable edition to anyone’s bookshelf. I can see it’s going to keep me informed and entertained for years to come. Oxford University Press has kindly agreed to give one Tin and Thyme reader a copy of The Oxford Companion to Sugar and Sweets. To be in with a chance of winning, please fill in the Gleam widget below. You will need to leave a comment on this post, answering the question, which then gives you additional chances to enter if you so wish. Gleam will pick a winner at random from the entries received. If you are commenting anonymously, please give me some way of identifying you as I will be verifying the validity of entries. Any automated entries will be disqualified. This giveaway is only open to those with a UK postal address. Winners will need to respond within 7 days of being contacted. Failure to do this may result in another winner being picked. Prizes are offered and provided by Oxford University Press and Tin and Thyme accepts no responsibility for the acts or defaults of said third party. Tin and Thyme reserves the right to cancel or amend the giveaway and these terms and conditions without notice. I would like to see an impartial comparison of sugar and alternative natural sweeteners such as honey and maple syrup. As calorie content is similar, what advantages, if any do the alternatives have? Now that, Suelle, would be fantastic. There are sections for all of these things, but no single comparison entry. Looks like my kind of book, can see it stacked nicely next to my bed to read through! It’s the sort of book that you’d want kept by your bedside permanently as there is so much to dip in and out of, at least I reckon that’s where my copy will be taking up residence. Well you have half your wish Pete. Coconut is there but it seems rhubarb has no sweetness to warrant an entry. It doesn’t have a section on natural fruit sugars per se Maxine, but they all have their own individual entries. Most of them get a mention somewhere in the book Darrell, but I suspect not all together as you describe. What a beautiful book cover! Sounds fascinating. Would most like to see anything about caramel which I absolutely love! This book looks like it would great read on its own! Would like to see alternatives to sugar that’s natural and good for food allergies too. 🙂 Even better would be “diabetic” friendly as Dad seems to be missing out on lovely treats because he doesn’t want to be ill. There are lots of sugar alternatives listed Tracy with plenty of information about them. Wow what a lovely book, would like to have it in my collection! It’s a fabulous book Olivia, so much better than I was originally expecting. I love these sorts of books that you can just dip into and you learn something new almost everytime! I would love to see an analysis of why sweets are so appealing to us from such a very young age! I remember getting so excited about picking up at 10p tuck shop bag on the way to school and I loved watching Charlie and The Chocolate Factory and reading Hansel an Gretel because I love the thought of a witches house being made of gingerbread and cake! The exciting thought of swimming in a pool of hot chocolate is still in my head! Ah, now you’ve got me dreaming about a pool of chocolate Tracy – what a thought! I would like to see an entry about the various calorie-free sweeteners – saccharine, aspartamine, stevia, etc. With some background on their history, their advantages and disadvantages, and how they differ from each other and from sugar. They each get their own entry Simon, but I don’t think there is a comparison between them and that would be useful. There is certainly a section on liquorice, but yes your suggestion is a good one Penni. Ah yes, I like that idea Ruth. I’m sure if you read it all, you’d find plenty, but it might be nice to have a section on it. I would love a section on nostalgic sweets. Well there is a list of high end pastry shops from around the world Sarah, so you’ve sort of got your wish. Tips on how to fix things when they go a bit skewy! Looks like my kinda book! Haha yes CC, it’s definitely for the sweet toothed amongst us, although I reckon most people would get something out of it. What a beautiful cover! I do like this kind of food book – I remember Larousse from when I was about eight! More inspiring than a recipe book sometimes! Yes Fiona, very like Larousse. There is so much information, but as it all comes in bite size bits, it’s easy to get your head around – or is that just me? I would look up to see if tablet is in, and see if it I agree with it all. Love my gran’s tablet. Mind you, she’s 99 now, so doesn’t haven the same energy for cooking. Ooh it looks very interesting! You say science is covered in it: I’d love to see a section explaining the science behind how some of the best sweet things are made. For example, why are some processes, like fudge-making and tempering chocolate, so sensitive to just the right temperature? This looks like a fascinating read Choc. I love books like this, that you can just dip in and out of and learn something new every time. It’s just that sort of book Kath – I keep having to rest it off CT! coconut ice, I loved having that when I was growing up! Goodness Janie. I hope you’ve culled it to make room for more. But I know what you mean, most of mine are piled up on the floor as I’ve nowhere to put them. This one is worth making the room for though as it’s not actually a cookbook. Plenty of facts in this book GG, I’ve already learnt a lot. (thought I’d posted already, but can’t see it) I love tablet, so I wonder if tablet has its own entry? Or is it mentioned in fudge maybe? My Gran (now 99) made great tablet. I would like to see one on retro sweets! I think you’re right Felicity, it would be a hard book to give away. Crumbles and cheesecakes, because they are both delicious for my sweet tooth! Chocolate, any entry that mentions chocolate is perfect for me. It looks like a wonderful book. I enjoy baking and it would help me to ‘get to know’ so many of my ingredients. Awesome, I’d like to see change over time in our favourite desserts (have they become sweeter, other ingredient changes, etc). It’s got about 4 paragraphs on stevia Louise, so there is some information, it’s just not several pages. This looks like such a lovely book and just up my street. I don’t get a lot of time to read so I like to have a stack of books on my coffee table that I can dip in to when I have a sneaky five minutes. Entered with thanks. nice tasty things with reduced or no sugar apart from natural sources such as fruit. I am trying to cut down my sugar intake. I’d like to find out about sweets and puddings that are local to me, I enjoy finding out about my local history (as well as eating cake)! This book looks like it is a wonderful collection of sweet information but I am sure it would make the tummy rumble just reading about all that deliciousness! I would like to see honest appraisals of artificial sweeteners such as aspartame. I’m interested in how the sweets were discovered/invented! I’d like to see the origins of jam and maybe chutney I don’t know if that counted they have alot of sugar in chutney. Rhubarb and custard sweets would be fun and in the old sweetshop style! I’d like to see info about sugar controversy and the studies for and against it’s consumption. Sadly, the book doesn’t quite go this far Victoria, but I’m with you on rather wishing it did. I am fascinated to learn about the history of sweet treats offered at funfairs and seaside attractions, even before Victorian times. Candy floss, sticks of rock with names written inside, brandy snaps, toffee apples, & those pink & white nougat pieces. Everything so very sweet that children went crazy for. DEFINITELY my sort of book! I would like to see anything with caramel. I would like to see an article that shows why sugar is good! Yes in small doses but how you can be adventurous with just a little! I love this! I make a lot of sweets but it would be great to have a better understanding of the contents. I have a sweet tooth,so perfect book for me. I think my Mum would love this book. I think what she’d most like to see included is imagery of things like advertising of sugar and sweets across time.